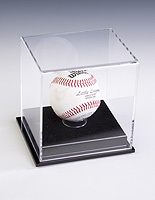 Baseball display cases are the ideal choice to show off all your game balls, autographed items & trading cards. It's important that sports memorabilia is kept in prime condition to help retain all of it's value. Using an acrylic case is a great way to both display items and keep them safe and in excellent condition. 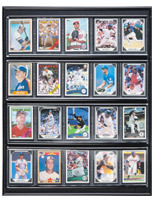 Our collection offers bat wall mounts, individual, double and triple baseball holders and wall mount trading card cases. 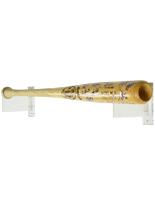 Any baseball fan will be able to proudly display their collectibles from their favorite teams and players. Any sports memorabilia enthusiast will find the products they need to show off their collections to envious onlookers. What kinds of sports memorabilia cases are available? Baseball Bat Wall Mounts - Choose from shadow box style cases or simple wall brackets that can be mounted absolutely anywhere. Select a bat display case to hold Wonderboy in all its glory, or perhaps store that souvenir you got because you were one of the first 500 people to get to the ballpark. For an accessible display arrangement choose a two-piece horizontal wall mount bracket that allows you to pick up the bat and give it a swing, just watch out for those lamps! Countertop Ball Holders - The ideal choice for autographed baseballs, these cases prevent excess damage and are the best way to show off your favorite autographs! 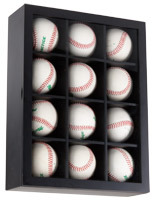 There are many ways to display a baseball, so why should you choose a baseball cube holder? A plastic baseball display allows the onlooker to see five sides of the ball to verify authenticity, see any nicks and smudges, or see all of the signatures if the ball was autographed by a group of players. These cubes include a ring for the baseball to sit on, and are built from 1/8" thick plastic to protect the ball from damage in the case it is knocked over or dropped. One popular item is the cube case with the injection molded rounded corners. This is a great alternative to sharp corners, and affords the observer a seamless view with a vintage touch while keeping the baseball safe from dust and debris. 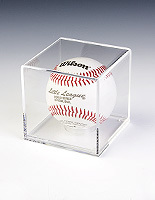 If you're a sports memorabilia shop or vendor at a flea market, go with the extremely affordable square acrylic baseball cube holder to display large quantities of autographed balls. Purchasing at large quantities will yield you a small per-unit price. Showcase your favorite baseballs with these risers today! Shadow Boxes - Baseball shadow boxes don't offer the same protection as an acrylic case, but can display many more items. Showcase your entire ball collection with a wall mounted baseball display case. These fixtures are perfect for shoppers that have amassed many balls with forward facing autographs. Arrange them alphabetically or by team for a stunning visual signature display. This looks great in a museum, in the living room or the hobby shop. Trading Card Cases - This wall mount display acts like a poster that users can easily take cards in an out of, making sure only the most prized cards are showcased. There's no need for the prized card collection you traded for as a youngster should be collecting dust in the basement. Looking for a great place to put that 1952 Mickey Mantle? How about that Upper Deck Legends piece of Babe Ruth's bat. Look no further, this trading card case will wow spectators as they scan your elite card collection. This works as a great piece for yourself, or is a great gift for a friend or relative. Looking to upgrade that man cave? Displays2go has you covered. Along with the huge selection of baseball cases, also featured are football & basketball cases. Make sure all your sports memorabilia is kept in tip top shape with a countertop holder. Whether for baseball, basketball, or football, any sports fanatic will be able to find the fixtures needed to improve decorate their lair.